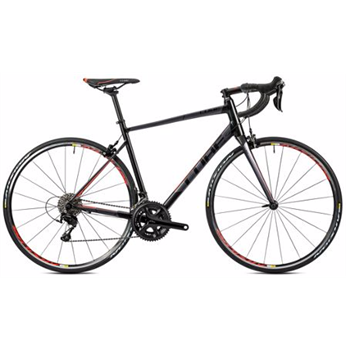 The Attain SL is a balanced and dynamic racing bike with an extremely efficient yet comfortable ride position. A high quality, aluminium frame and quality groupset create a lightweight package, suitable for fast rides or long training sessions. The Superlite Aluminium frame with tapered head tube, PressFit bottom bracket and mechanically formed down tube all help to increase steering precision and drivetrain efficiency. Carbon forks act as a vibration damper, for your comfort. With improved shifting and a re-designed crankset that allows you to change chain rings easily and quickly, the Shimano 105 800 groupset is the most versatile yet. In terms of performance, the Attain's 11 speed 105 groupset is not far removed from much higher end groupsets. Headset: FSA Z-t, Top Zero-Stack 1 1/8" (OD 44mm), Bottom Integrated 1 1/4"